A new report reveals that the sugar industry heavily influenced federal research—as well as the guidelines that resulted from that research. Tooth decay remains a problem in the U.S. despite being preventable. One simple fix is cutting back on overall sugar intake. But a new report published in the journal PLOS Medicine reveals that the sugar industry greatly influenced the U.S. National Institute of Dental Research (NIDR) 1971 research by shifting the group’s focus away from dietary changes. It’s a mistake nutrition and dental experts say had long-lasting consequences. Researchers from the University of California, San Francisco, (UCSF) reviewed internal sugar-industry documents between the years 1959 to 1971, a period when the NIDR was trying to figure out which tooth decay-related interventions could wipe out the problem in a decade. 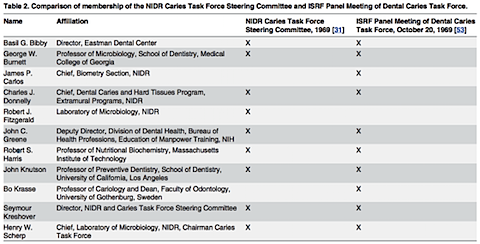 In 1967, an advisory council recommended NIDR focus its efforts on dietary changes. And by 1971, the agency had launched its National Caries Program—but it didn’t tell Americans to start focusing on their sugar intake. “It’s extremely shocking to see how closely NIDR [and the sugar industry] worked together, and how the research priorities between the two groups were so aligned to benefit the sugar industry,” says study author Cristin Kearns, a postdoctoral scholar at UCSF School of Medicine. It turns out the sugar trade organization and the government groups were making some behind-the-scenes deals. "One could say, on logical grounds and good evidence, that if we could eliminate the consumption of sucrose, we could eliminate the problem…We are realists, however, and we recognize the value of sucrose to nutrition." In late 1969, the ISRF submitted its findings to the NIDR tooth decay task force, and the authors of the PLOS Medicine report show that 40% of the report’s content was taken, nearly word-for-word, from the sugar industry report. “The sugar industry was able to derail some promising research that probably would’ve been the foundation for regulation of sugar in food,” says study author Stanton A. Glantz, the director of the Center for Tobacco Control Research and Education. And this was at a time when nutrition experts say the role of sugar in tooth decay was well-known. “Dental researchers were well aware that even small amounts of sugars promoted tooth decay,” says Marion Nestle, a professor of nutrition, food studies, and public health at New York University. She notes that the 1977 U.S. dietary goals called for a 40% reduction in sugar intake. “Tooth decay is 100 percent preventable,” agrees Dr. Kevin Boyd, a dentist and an attending clinical instructor at Lurie Children’s Hospital in Chicago. “I think this [report] is going to be a game changer. At a young age, children and parents need to be consulted on diet.” Neither Boyd nor Nestle were not involved in the new paper. According to the researchers, major medical institutions still allow the sugar industry to influence its decisions. “Industry opposition to current policy proposals—including a WHO guideline on sugars proposed in 2014 and changes to the nutrition facts panel proposed in 2014 by the FDA—should be carefully scrutinized to ensure that industry interests do not supersede public health goals,” the study authors conclude in their paper. In a statement sent to TIME, the Sugar Association says: “It is challenging for the current Sugar Association staff to comment directly on documents and events that allegedly occurred before and during Richard Nixon’s presidency, given the staff has changed entirely since the 1970s. However, we are confused as to the relevance of attempts to dredge up history when decades of modern science has provided answers regarding the role of diet in the pathogenesis of dental caries… A combined approach of reducing the amount of time sugars and starches are in the mouth, drinking fluoridated water, and brushing and flossing teeth, is the most effective way to reduce dental caries.” The statement has been shortened for brevity. The National Institute of Dental and Craniofacial Research (NIDCR) and the American Dental Association did not respond for comment by publication. This page contains a single entry by Archimede published on March 16, 2015 4:11 PM. Maker of Children's Tylenol to plead guilty over recall was the previous entry in this blog. Disease decline before introduction of immunisation is the next entry in this blog.